Hello, everyone. Today I bring to you a special post with a Q&A about Take Me Tomorrow and plus some interesting details about its author, awesome Shannon Thompson, who was nice enough to respond to my ramblings about the book, which if you haven’t read please go here and found out more, or read the review I made couple of days ago: Take Me Tomorrow Review. If you haven’t read the book, I strongly recommend that you do not read the upcoming lines because it may contain some spoiler. That’s it, let us start. Q: I am sure you’ve been asked this but, is there going to be a sequel? 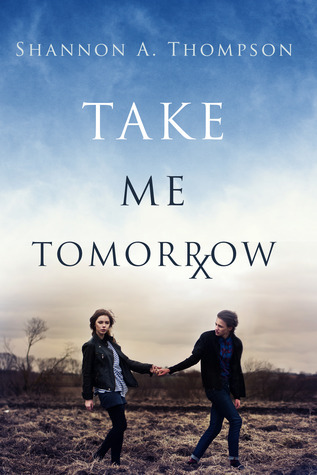 Author: There is a sequel – Take Me Yesterday – as well as a third novel – Take Me Now – written, but neither have guaranteed contracts to be published. Sharing the novel around by reviewing it helps out a lot! Q: Tell me, what inspired you to write about Take Me Tomorrow? I encourage you to visit the link and learn more. Q: How you came up with the name ‘Noah’, did it just pop in your head or is there a special meaning? Q: A main thing about the Drug, did Noah really prevent Sophie from dying? Author: Take Me Yesterday, the sequel, would explain that, but for now, it is a mystery. That being said, yes, she should’ve died and didn’t. The question of “why” was left open-ended. Q: The effects or rather the events foresighted with Tomo can be stopped? Or is it just Sophie? Author: Eek. I love these guesses, and I wish I could say more so badly, but you are onto something! Q: Are all of these questions going to be answered on a sequel? And hence you won’t really tell me much? Q: How was the world before the massacre? There are bits and pieces in the book but how was it truly? Author: Take Me Yesterday will visit the past and explain more about the massacre, but there was a significant reason as to why Sophia didn’t explain it in the first book. Sophia was young when the even took place, and it didn’t affect her loved ones. I was also young when 9/11 happened – 10 years old – and it took me many years to understand what had happened. That was the main reason for the approach, but it also was a result of the heavy censorship Sophia’s environment is controlled by. The Internet doesn’t exist – something the sequel will explain – and the government doesn’t leave news sitting around for just anyone to speculate on. Because of this, Sophia’s focus is on her direct friends and family. But her focus does shift in the second book, and you do learn a lot about the massacre. Q: If you had to do it all over again, would you change anything about the book? What would it be? Author: Not at all! Sure, I wish I could’ve shared more about the massacre. I was dying to. But Sophia wouldn’t do it, and I didn’t want to force her. Originally, Noah even told half of the story (like how Jessica and Eric alternate in my previous publication of The Timely Death Trilogy) but Noah is more-or-less always on drugs, so his voice bounced around all over the place. Most of the time, he never made sense, so it ultimately got cut, and I realized it was Sophia’s story that had to be told. Author: It’s beautiful, isn’t it? I have the wonderful Clarissa Yeo at Yocla Designs for designer the cover. Q: What was the hardest part of writing T.M.T? Author: The hardest part for me was realizing how much of my personal life eventually crept its way into the storyline. Most of that will come up in the sequels, but I found myself giggling when people mention Take Me Tomorrow’s beginning grounding it in dystopia – a girl with a knife collection running through a forest with her dog? That was actually very close to my teenage years. I have a knife collection to this day, but sadly, Shadow – the husky I based Argos on – has passed away. Dwayne is very close to my father as well. My dad was a traveling businessman, so he wasn’t home often. Little correlations like that never occurred to me while I was writing the novel, but it showed up later on when friends and family pointed it out to me when they were finished reading. Q: What’s ‘cooking’ right now? What are you plans for the upcoming months? Author: The last novel in The Timely Death Trilogy, Death Before Daylight, releases January 29, 2015 by AEC Stellar Publishing, Inc.
Q: If you have to choose a reading genre, which one would it be? Author: For reading, I would grab a memoir any day. I love memoirs. For writing, I lean toward YA, which is my second genre I love to read the most. Author: Create your own mantra that will keep you going by reminding you what is important to your life and goals. Mine is “Write with passion; succeed with self-discipline.” It keeps me focused, but it also reminds me that everything starts with the love for writing. Q: What inspires you to start writing a new story? Author: So many different things! The world around us is inspiring. I have a harder time NOT getting inspired than getting inspired. Q: Do you have any location, a special place where you like to write? Author: The past few novels have been rewritten and edited in a local hookah house, but I love writing in public in general. There’s something about the chaos passing me by that keeps the words flowing. Q: Did you ever think you wouldn’t make it? I refer to the fact of having books published, was there a time when you thought it wouldn’t happen? Author: Of course! I started seeking publication when I was 13 years old. It took me three years to have my first novel published, and seven years passed between my first and my second novel. I still think it won’t happen all the time. Every new book feels like the last one to me. Not because I don’t already have new ones written. I do. But because there’s always a fleeting moment of fear, especially when you’ve worked so hard to chase the dream, but I try to remind myself of how humbling it all is – being able to share your words with the world isn’t a small thing, and every time I get the opportunity, I am grateful. And with that we were done. I express my gratitude once more to Shannon for being so open-hearted and letting me in. I hope you enjoyed this special and go running straight to the arms of some of the books by this author. Keep in touch lads and lasses, have a nice day or night! To keep in touch with me, go to @EachPage and EachPage Tumblr.